Happy first official day of Fall! I thought it would be appropriate since it is to share my first pumpkin recipe of the season with all of you! 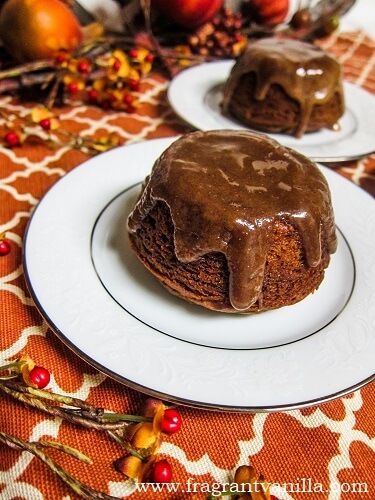 My Mom recently asked me if I would make some pumpkin lava cakes, and of course I could not say no because they sounded amazing. 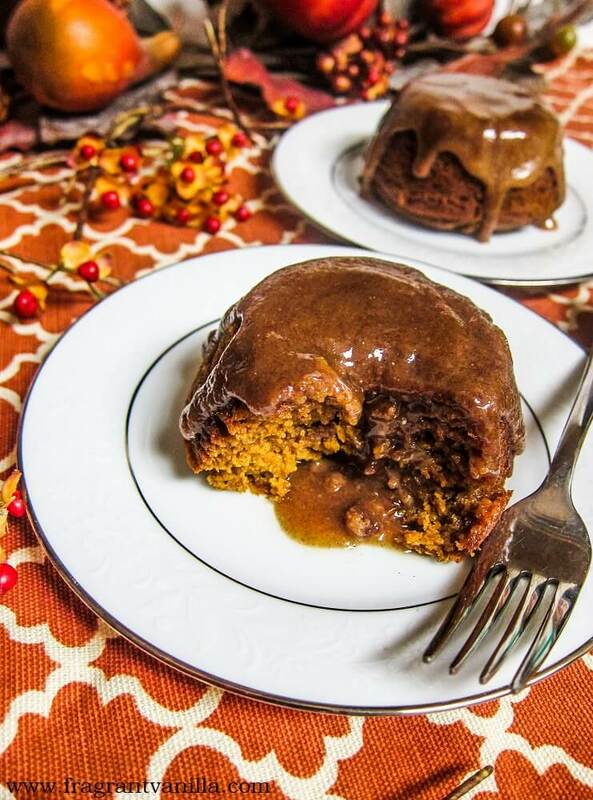 I have been eyeing the cans of pumpkin at the store for a few weeks now, but since Fall was a couple of days away I bought some and decided to make those cakes. I love pumpkin in cake. It gives it such a soft, moist tender crumb when cooked for the proper amount of time. I was always excited when my Mom decided to make a pumpkin cake with that fluffy white whipped cream frosting or a pumpkin struesel cake when I was little. It was the type of treat I loved coming home to and I knew Fall had begun. So now that Fall has begun it is time (even thought I made them a few day early because it felt like Fall with a chill in the air). The day I decided to make these, it was raining like crazy and I was totally soaked and cold when I got home from work, since my shoes got submerged in a giant puddle walking out to my car, and the rain was blowing so my umbrella didn't do much good. So when I got home, I put on my comfy warm fleece PJs and got to work on my cakes. There is nothing better than being comfy, firing up the oven, and baking something delicious while listening to good music when it is a chilly day. 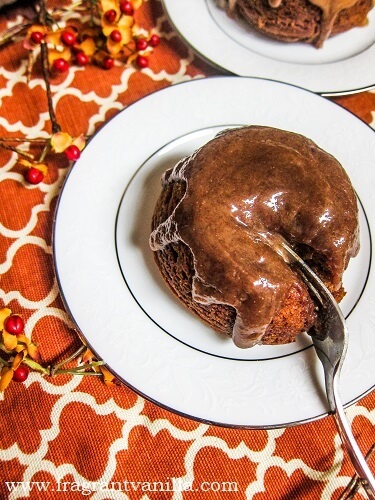 I have made lava cakes before, and every time I do, I ask myself why I don't make them more often, because they bake up fast, and they are always good. When most people think of lava cakes, they think of chocolate, but I went outside the box here and filled them with caramel. Because caramel and pumpkin are a match made in heaven! These cakes actually happen to be mostly fruit sweetened as well because I sweetened the cake with dates to give it a nice caramel flavor. The batter tastes so good! Of course it had to have all of the usual pumpkin spices too, because spice cake should be warming and aromatic. For the "caramel" filling I used a mixture of pecan butter and a little maple syrup. I know it is not technically caramel, but it tastes like caramel, and is much healthier than refined sugar caramel typically used in this sort of thing. They baked up nicely and smelled amazing when I pulled them from the oven. I couldn't wait to try one, but of course I had to wait 10 minutes to un-mold them. It was so worth the wait though! I spooned some of the extra caramel over the top, because why not?! And I dove in. 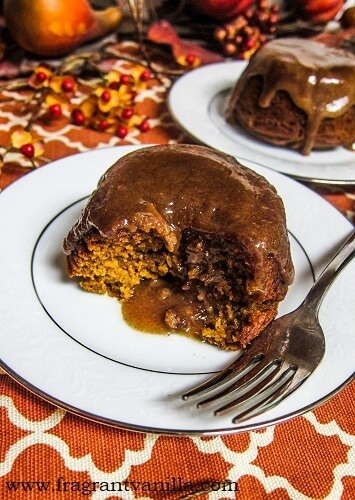 The texture was soft, and they had just enough spices, and the gooey caramel in the center was amazing with the pumpkin! 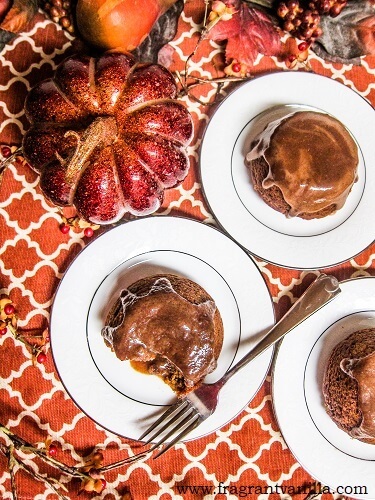 You can enjoy these in under an hour, so they are the perfect dessert for Fall when you want something fast without having to put too much effort into them. Anyone else all excited about pumpkin? Oil four 1 cup custard dishes or ramakins with coconut oil. Place dates, reserved water, pecan butter, pumpkin, and vanilla extract into a blender, and blend until smooth, then whisk this blended mixture into the flour mixture until well blended. Whisk in the cider vinegar until bubbles form. Whisk together the caramel ingredients until smooth (adding more water if you think it is too thick). Transfer half of the cake batter to prepared pans filling them half full, drop 1 Tbsp of the pecan butter caramel mixture into each in the center. Spoon the remaining batter over each one, place on a tray, and place in the oven. Bake cakes until they are set, but not over-baked about 15-18 minutes. Remove from oven, let cool for about 10 minutes, then un-mold, drizzle with more of the caramel, and enjoy warm. Thank you! Awesome! I hope you enjoy them as much as I did :)!